Leaving your boat in Finland for the winter - Sail in Finland! It’s no secret that Finland is a bit peripherally located at the far end of the Baltic sea, but the slightly remote location is part of the charm of Finland, the Mediterranean-like crowds are nowhere to be seen and sailing is just that little bit more of an adventure. The downside of course is that it takes a bit of time getting here and back. If you are on a schedule, the length of the round trip might be an issue. But there is a great solution to the problem: why don’t you plan on leaving your boat in Finland for the winter? In that way you can keep a nice and leisurely pace both coming to Finland as well has heading back homeward. M-Yachts is a leading Finnish full-service boat yard in Valkom, just outside Lovisa (east of Helsinki). M-Yachts caters to a wide range of customer needs starting from simple outdoor storage without any other services all the way to renovation and rebuilding projects. I asked M-Yachts for some suggestions for a full-service package for winter storage in Finland and they kindly put together two packages: one for a sail boat and an other for a power boat, both in the 40 foot class. The chosen boats were a Rustler 42 (long keeled sailing boat, 12,8m long, 11 tons ) and a dual-engine Princess 40 (12,67m long and 12 tons). The packages have been composed in such a way that the owner can simply leave the boat at the yard at the end of the season only to arrive in the spring to find the boat back in the water and ready to go. Boats up to 30 tons can be lifted at M-Yachts. The packages include heated indoor storage so you can leave your stuff on the boat and do not need to worry about separate storage or mildew issues. Cheaper cold and outdoor options are also available. They also include basic engine, rigging and equipment overhaul assuming no repairs are needed. In the spring the boats will be painted and waxed so that the only actions required by the owner is to stove any gear, top up the food supplies and sail away. Prices in €, including VAT. Leaving your boat in Finland is basically very easy. You should start by deciding on where in Finland you want to leave your boat. For easy airline access you would want a yard close to or in Helsinki, but the storage prices are lower if you select a yard further away from Helsinki. Once you have selected a good location, contact the yards in the vicinity and ask for a quote. As part of that negotiation and quote procedure you should agree in detail on what maintenance and other work you require (see section below on special restrictions for boats from outside the EU). For instance M-Yachts has a very nice online contract system where the contract is negotiated and documented on-line. In this way you know exactly what you have agreed on. If you want to do some of the maintenance work yourself, most yards will allow you to work on their premises and can help you to find accommodation close to the yard. Payments are normally handled via bank transfer, check with the yard for their preferred payment method. 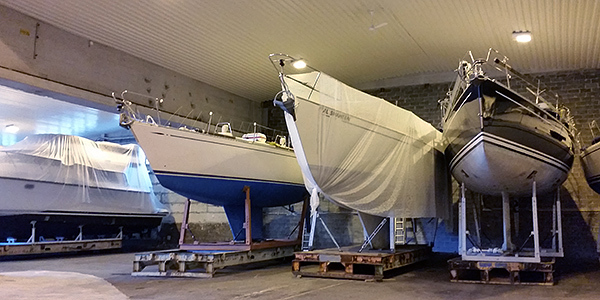 Boats waiting to be moved into winter storage at M-Yachts in Lovisa. If you live in the EU and your boat is registered in your home country, you can freely leave it in another EU country for as long as you wish. If however your boat is registered outside the EU or in some of the EU special taxation regions (such as the Channel Islands and, lo and behold, the Åland Islands), special restrictions apply. The two main issues to be aware of are: your boat can stay a maximum of 18 months in the EU without special customs clearance and you need a special customs clearance for service work that is not classified as “routine maintenance”. For more information, check out this information leaflet by the Finnish Customs. If you need more information about customs etc, you can also contact the Finnish Customs using email to [email protected]. There is something called the “temporary importation procedure with total relief from import duties” which allows you to keep your boat inside the EU for up to 18 months without paying any taxes. In addition to the time restriction, the rule also stipulates that you should stay on your boat all the time. “Procedure” sounds like there is a lot of red tape, but in this case the “procedure” is automatically started when you enter EU. For your own protection, secure some kind of evidence for when the boat has arrived in Europe. For instance, if you enter Finland from Russia, you are not required to fill in any customs forms regarding your boat so there will be no official record of the entry. Therefore retain some evidence about when you and the boat have entered the EU, at least a stamp in your passport or similar. Cold storage and outdoor storage are cheaper alternatives to heated indoor storage. There is one important exception to the rule that you must stay on your boat throughout your visit to Europe; you can leave your boat in winter storage, for instance in Finland. In this case “winter storage” means that you need to have a commercial contract with a boat yard (such as M-Yachts) for the storage. The 18 month clock will be ticking also when your boat is laid up for the winter. One small detail to note, the contract for winter storage must include the authorization of a natural person (ie someone at the yard) to be allowed to use the boat while you are away. Example: Assume you sail across the Atlantic from the US and enter the EU in Ireland on April 1, 2015. Make sure you get some proof of entry from the Irish customs or immigration for your boat. You then sail along the North Atlantic coast and up to the Baltic and Finland, where you arrive at the end of August, 2015 (perfect time for sailing in Finland, btw). In Loviisa you leave your boat at M-Yachts for winter storage and arrive back in Finland in June 2016 to continue sailing. You then have time until the end of September to sail around in Europe but by October 1, 2016 you should have left EU waters. If you need to leave your boat in Finland/EU so that the total time in the EU exceeds 18 months, one way to avoid import duties is to use what is called the “customs warehousing procedure“. In this case your boat is placed in a special customs warehouse. The time a boat can spend in the customs warehouse is not limited, but there is a fee for using the warehouse. If you need this type of service, you can contact the company Kotka Yacht Store, they specialize in this type of service. Only routine maintenance allowed without special customs procedure. While the 18 month rule is quite understandable, this other rule is, should I say, pretty daft. That rule states that while your boat is in winter storage, only “routine maintenance” can be applied to it. Basically “routine maintenance” is defined so that the condition of the boat is kept at the level it had when entering the EU. If you want to have any kind of improvement work done (in theory even installing some new equipment) the company doing the maintenance work must report the work to the Customs and – what is much worse – place a guarantee for the possible VAT and import taxes that would be levied on the boat if it were to be imported into the EU. As the VAT in Finland is 24%, this means that the company doing the maintenance must place a guarantee equivalent to 24% of the value of the boat, regardless of how big or small the improvement work is. Cleaning the bottom is always a part of winter storage. Most yards in Finland are rather small companies and do not have the means to give such monetary guarantees for big boats, so if you need significant maintenance to be done, be prepared to provide the guarantee to the company that then forwards it to the customs.